Currently, we carry 100% Cotton 230 Thread Count Pillow Protector manufactured by our company, as well as Down Etc. � Tear Drop Luxury Pillow Protectors. Both types of pillow protectors are a great choice. 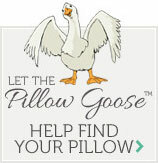 If you prefer a more soft pillow protector, Down Etc. � Tear Drop Luxury Pillow Protectors will be a great choice for you. However, if you would like a more durable option, choose our very own 100% Cotton 230 Thread Count Luxury Pillow Protectors. Either way, don't go another night without a pillow protector on your pillow.